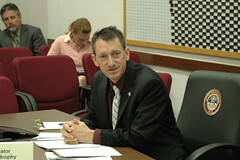 Senator Greg Brophy represents Colorado State Senate District 1 which includes: Cheyenne, Elbert, Kiowa, Kit Carson, Lincoln, Logan, Morgan, Phillips, Prowers, Sedgwick, Washington, and Yuma Counties. Tell Senator Brophy what issues matter to you! State Senator Greg Brophy serves Colorado Senate District 1, a large rural district in Eastern Colorado. He was first elected to the House in 2002, won a vacancy committee appointment to the Senate in 2005 and won election to the Senate in 2006 with nearly 72% of the vote. Greg is the ranking member of the Senate Agriculture and Natural Resources Committee, the Senate Finance Committee, and Legislative Legal Services Committee. Greg was born in Holyoke, Colorado and grew up on his family’s farm in the sandhills north of Wray, Colorado. He graduated from Wray High School where he was a state champion wrestler. He graduated in 1988 from Colorado State University with a degree in Animal Sciences. Greg returned to his home town of Wray after college where he worked as a professional farm manager while operating his own small family farm. He grows corn, alfalfa, beans, watermelons and wheat. He is married to Angela. They have three children, Megan, Jordan, and David. They make their home in Wray. Greg’s hobbies include cycling and shooting.